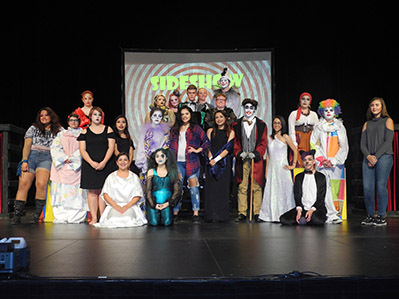 Artesia High School Drama students, above, take center stage during dress rehearsal Thursday evening for their NMAA Theatre Competition piece, “FREAK” by Angela Hill. The piece is a bold, dark, one-act play concerning themes such as bullying and teen suicide. Monique’s constant torment at school makes her feel like a sideshow freak; she wishes she could just disappear – and then she does. “Monique the Freak” finds herself in an “unusual, disturbing and fantabulastic” sideshow and must learn why she is there from the other outcasts that lurk inside. This fantasy social drama ultimately emphasizes hope, and it is hope that finally leads Monique home. 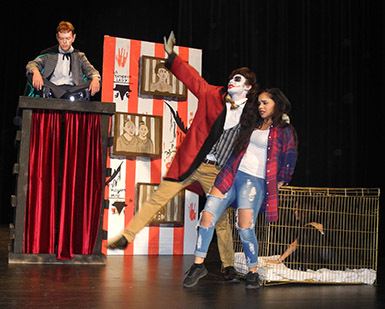 Below, Monique, played by Thalia Luna, is greeted by Maniacal Max (Nolan Winters) as Benny the Bat Boy (Lowell Irby) looks on. The play will be presented at 7 p.m. Saturday, Oct. 21, at the AHS Auditorium. Admission is free; doors open at 6:30 p.m.